My dumplings take after my father’s. I don’t remember how old I was when I first learned how to make them, but my palms were small enough for our floppy, store-bought wrappers to easily drape across and over their sides. Dumplings were always a family production, our four-person assembly line wrapped around a flour-dusted dinner table. My first role was wetting the wrappers; I eventually worked my way up the ranks. My father taught me how to fill, fold, and pinch the edges closed just so—a firm pinch to seal the middle, then two more on each side, a fluid maneuvering of the thumb and index finger to create two symmetrical pleats—just as his mother taught him and his brother, their own assembly line folded into a cramped kitchen in the city of Zhengzhou, China. 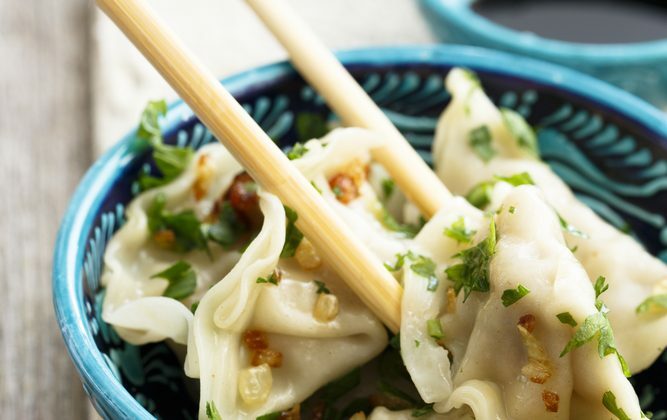 Growing up in a Chinese family in California, dumplings graced my dinner table year-round. Nights spent making them are some of my fondest memories. We made them for Thanksgiving, sometimes for Christmas, sometimes on a free weekend and throughout the days that followed, cooked from the stash we would make ahead for the freezer. But we always, most crucially, made them on Chinese New Year’s Eve. 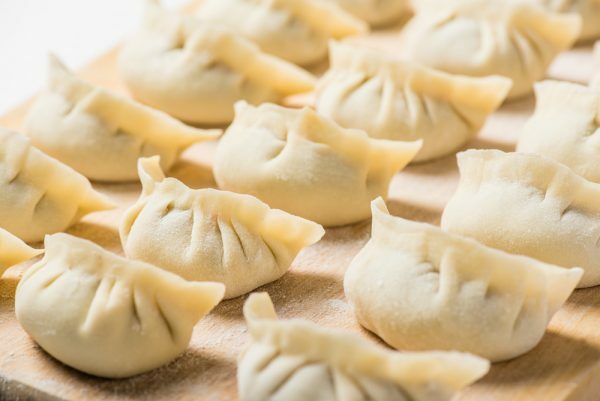 Today, Chinese families all over the world make dumplings, or jiao zi, on New Year’s Eve, filling and folding late into the night and enjoying them as the year transitions into the next. It’s an inherently communal activity—tedious done alone, but made faster by extra hands and good company and conversation. The roots of the tradition, however, are in northern China, where wheat was historically the staple crop. And for a celebration so late in the winter, when food was scarce, dumplings could stretch what little meat and flour families had left into a feast. As to be expected from a food with roots in a five-millennia-old culture, the dumpling’s exact beginnings are hard to pinpoint. But Chinese legend traces them back to the Eastern Han Dynasty (25–220 A.D.), to a sage named Zhang Zhongjing. As the story goes, Zhang, a revered physician of traditional Chinese medicine, returned to his hometown during a harsh winter and saw many impoverished people suffering from starvation and cold—to the point where their ears were frostbitten. Known not only for his medical expertise, but also his compassion, he set out to help. He and his disciples erected a tent and a cauldron, in which he simmered a concoction of lamb, pepper, and medicinal herbs—all “warming” in nature, according to principles of Chinese medicine. He then wrapped spoonfuls of minced stew in rounds of dough, folded and pinched them closed in the shape of an ear, and dropped them back into the pot to boil. Frostbitten patients were prescribed two ear-shaped dumplings and a bowl of the nourishing broth each, warming them through and curing them of their frostbite. Zhang distributed his dumpling soup from the winter solstice to New Year’s Eve, refusing no patient in need. In tribute to his life-saving kindness, it became a tradition to eat dumplings on both holidays: Dongzhi, the Winter Solstice Festival, and the eve of Chinese New Year, the Spring Festival. The comfort of a steaming platter of dumplings on a cold winter night remains timeless. But now, families are more likely to make them for fortune than for frostbite—the crescent pouches also resemble yuan bao, boat-shaped gold ingots used as currency in ancient China, and thus are considered good luck to make and eat. At their core, dumplings are simple fare. Flour and water are all it takes. Patient kneading and a brief rest bring them together into a firm but pliable dough, and floured hands coax it into long, thin ropes. Deft cuts with a butcher knife divide them into tiny nuggets for later rolling into rounds. When it comes to the filling, as many variations exist as the number of people making them, but fatty pork and napa cabbage are the backbone of the most traditional. Into the meat go fragrant ginger and scallion, chopped almost into a paste, followed by glugs of sesame oil, soy sauce, Shaoxing wine, salt, sugar, and an egg—the amounts judged not by measuring cups and spoons, but memory. A flurry of minced cabbage, chopped painstakingly fine under a swift butcher knife, finishes it off. Some recipes swear by salting the cabbage beforehand, to draw out excess water, and then wringing it dry to prevent a wet, mushy filling. My mother goes a different route: she dries the chopped bits off as best as she can, then gives them a good toss in oil. The idea, she explains, is to coat each piece and lock in its moisture, thus adding pockets of juiciness to the filling without sacrificing the integrity of the rest of it. Sound science or not, I take her word for it, as you’re meant to do with that kind of mother’s wisdom; it’s hard to argue, anyway, when the final product is just as tender and juicy as promised. A pair of wooden chopsticks, gripped together in a fist and unceremoniously stuck straight up into the filling, is our mixing tool of choice. Bouts of vigorous stirring—always in one direction, and not so much that it’s reduced to mush, my mother warns—bring it all together. Then comes the fun. We naturally form our living room assembly line. Since we’re a small army of four, we often switch our roles as needed. If we’re using store-bought wrappers, my little brother is tasked with wetting the edges with a fingertip dipped in water, to make them easier to seal. Fresh dough wrappers need no wetting, but there’s extra work to be done. My brother flattens the nuggets of dough into chubby discs, and my father and I take on the task of rolling them out. There’s an art to it I’ve yet to perfectly master, a dexterous dance between rolling pin and dough: one hand constantly rolls the pin back and forth, over no more than half of the disc of dough at a time, while the other hand holds the disc and continuously rotates it, so that the pin eventually works its way around the whole thing. A well-made wrapper is thinner toward its edges and thicker toward the middle, and sports a tiny bump right in the center. Prepared wrappers move onto the next station. Armed with a pair of wooden chopsticks each, my mother, father, and I place careful dollops of filling into the center of each circle—not too little, not too much—then fold them into crescents and pleat and pinch the edges shut. They take their place among rows of perky brethren lined up on rusty baking pans covered with foil. When we’ve amassed enough for a test batch, my mother moves to the kitchen to tend to the stove. We make shui jiao, boiled dumplings, though others may opt for pan frying or steaming. Into a pot of boiling water they go, each followed by the gentle scrape of a spatula along the bottom, to set the water in motion and prevent the dumplings from sticking. Three times she waits for the water to reboil, adding cups of cold water in between. When they’re all cooked through and float to the surface, they’re fished out with a slotted spoon. Taste, adjust the filling’s seasoning as needed, repeat. A broken dumpling is a bad omen—and a sign of poor craftsmanship by its maker. A chronic over-stuffer, I frequently bring misfortune to our table. “Making dumpling soup, are we?” my mom would ask, laughing, referring to the now vaguely meat-flavored cooking liquid, thanks to my inevitable busted wrapper or two. But the majority emerge intact, if much wrinklier than they went in, to be piled onto plates and carried over to a dinner table still covered in flour. We peel sticky dough off our fingertips, rest palms swollen from rolling and fingers tired from pinching, and arm ourselves with clean chopsticks and bowls of chili oil-laced vinegar and soy sauce. Beaming at our work, and at each other, we feast. Over the years, the steps and motions have been ingrained into my memory. On Chinese New Years since, spent in places far from home, I recreate the familiar scene with new faces gathered around the table. In a college apartment, I proudly demonstrate my skills for an eager-to-learn roommate. At a friend’s place in New York City, celebrating with a group of Chinese and Taiwanese friends, I add my dumplings to a cast of others with motley shapes and folds. They’re stamps perhaps of other assembly lines and childhood memories, other families and their dumpling traditions. To have my own to cherish and someday pass down, I feel incredibly lucky. Given that my family’s dumplings are measured and made by eye and memory, I unfortunately have no standardized recipe. Hsiao-Ching Chou, author of “Chinese Soul Food” and pot sticker-making veteran (she’s taught friends; countless students in monthly pot sticker classes in Seattle; and once, Anthony Bourdain, on his travel show “No Reservations”) kindly shares hers below. 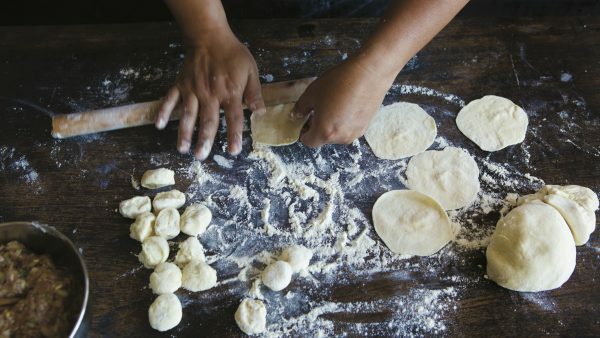 Every Culture Has Its Dumpling—Who Copied Whom? Reflecting on the true spirit of the season and the wisdom of kindness and charity can help us boost our mood and dissolve the holiday blues.